and a pom pom beanie. I think it's safe to say that a girl can't go wrong with these four things during the winter season. It's easy to add a little excitement to a neutral outfit with fun pops of color, such as pink! 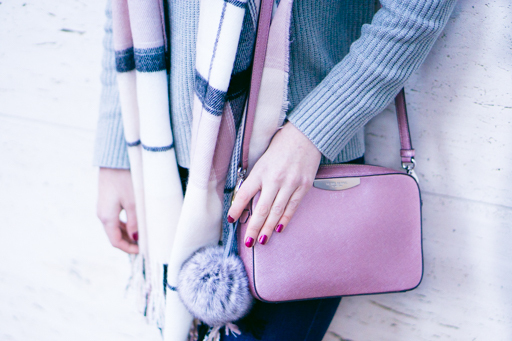 Adding a plaid, pink scarf with a pink bag can brighten up an otherwise plain outfit, and a pom pom hat is like icing on the cake! This gray sweater from Nordstrom is so cozy and goes with absolutely everything in my wardrobe, and my suede taupe booties are surprisingly comfortable and perfect for long days walking around the city. The great thing about them is that they can be dressed up with a skirt and blouse, or casually dressed down with a pair of skinny jeans and a sweater. Now that winter is finally here in Charlotte, I will be reaching for these favorites daily! Now tell me, what are your go-to winter staples? Thank you girl! I appreciate all of the love! I'm also loving your blog! All can say is wow... great styles here. Besides, you look really awesome!